Yuske Hirota was born in Tokyo and grew up riding in Hakuba, Japan. At 19-years-old, he dropped out of the University in Tokyo and traveled to Canada to take a semester long mountaineering course. This was a decision that ultimately changed his life. Since then, he has been to Alaska, Peru, Patagonia, New Zealand, Nepal and Canada on winter climbing and splitboarding expeditions. 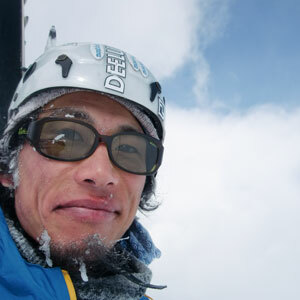 In 2012, he became the first person from Japan to pass the Association of Canadian Mountain Guides Ski Guiding Course on a splitboard. Yuske now has his own guiding operation, The Tao of Pow. For 15 years. I've been guiding since 2003! JMGA stage 1 Mountain Guide, ACMG assistant snowboard guide, CAA avalanche operations level 2, Japan Avalanche Network professional member. John Buffery aka Buff. He was the mentor of Craig Kelly. He has been one of the biggest supporters of snowboard guides in Canada - even before snowboarding was recognized as a tool for winter guiding. He used to come to Japan to teach avalanche courses and I used to work for him as an interpreter. A few years later he gave me a chance to work for Baldface Lodge, Nelson, BC. Now I am based in Japan but his lessons have saved me many times in the mountains. He is my lifetime Sensei. Rocking Pro-bindings all winter, guiding, and of course, new snow! Because it is simple and reliable. Two very important things in the backcountry.